By Asia Morris – LBPost.com – Photo: Asia Morris. 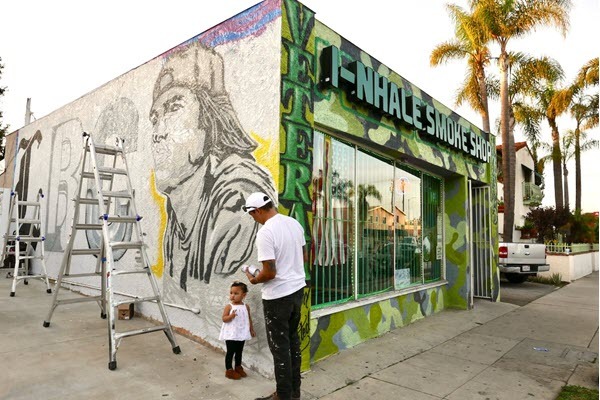 Photo: Artist Erick Guadarrama’s almost 2-year-old daughter, Theresa, helps with the portrait of Long Beach native, philanthropist and music producer Tito Rodriguez at i-nhale Smoke Shop. Saturday, Jan. 26. Cars on Redondo Avenue near 10th Street noisily speed by on a Saturday afternoon, as artist Erick Guadarrama works on a larger-than-life portrait of Tito Rodriguez, the Long Beach native, philanthropist and music producer. Growing up in Long Beach, California, Rodriguez lived next door to Goldie Loc, one-third of the hip hop group Tha Eastsidaz—made up of former Death Row Records artists Snoop Dogg and Tray Deee who left the label to start their own group. The two worked together in the ’90s hip hop scene, Goldie Loc as a rapper and Rodriguez as a producer.